A buyer persona is a great tool for improving understanding of your important customer segments and communicating this knowledge to the wider business. Personas help bring your customers to life and get away from using descriptive statistics that rely on averages that are highly misleading. There is no such thing as an average user. A good persona should be based on segmenting your customer base and can be used to personalise your user experience for individual segments. Treating all users the same will only lead to an average conversion rate. I have previously outlined a process for using personas to improve your conversion rate. This is based upon the Buyer Legends process developed by top US customer experience pioneers Bryan and Jeffrey Eisenberg. If you need a persona template for Word or an online tool for building buyer personas there are some excellent free persona creators. Below are 7 free persona template tools for you to create and share your buyer personas. I have summarised the features of each persona template to provide an indication of what they offer. My personal recommendation for a persona template creator is Xtensio as this provides an excellent and flexible framework that is easy to complete and customise. You can also add new sections as required to create an awesome persona template. 1. Kayak: This persona template uses a question and answer approach, though the number of questions and topics is not very comprehensive. This does make it a quick tool to use, but not all the questions will be relevant to all personas and there does not appear to be a way of changing the questions. There is also no save functionality on the site as your persona is emailed to you within half an hour of completing the process. The lack graphical formatting or a one page summary does limit the use of the tool, but it can be used to help start the persona building process. 2. Makemypersona: from Hubspot: This is a free step-by-step wizard persona template which takes you through the process of creating your own buyer persona. In addition Hubspot offers a free downloadable template in exchange for your name and email address. The online tool is very intuitive and easy to use. The tool allows you to select a stock photo to represent you persona and emails you the completed persona as a word document after about 15 minutes. 3. 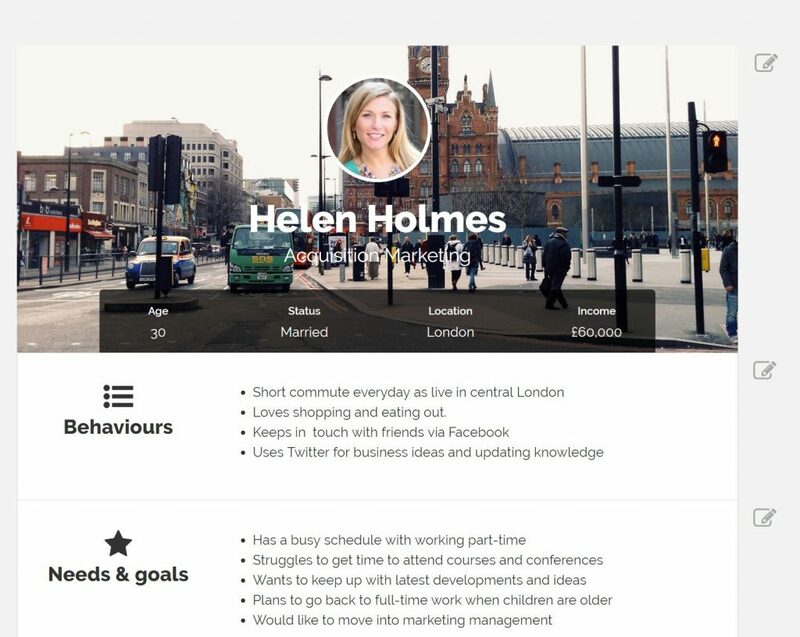 Personapp: A free web based persona template app for creating informal personas and sharing with your colleagues. Join up and start creating single page personas in a matter of seconds. You can easily add new sections to customise the template for your specific needs. It allows you to save your personas online, share, print and save personas as a PDF document. 4. Up Close & Persona: A free persona template app that asks you questions to help you understand what motivates your audience. The interface is simple to use, though some of the questions have too few pre-set answers (e.g. there are only 3 age ranges). The app does have a fairly extensive range of questions and displays the full persona when you submit at the end. The persona is also emailed to you, but it would benefit from a 1 page summary of the persona rather than having to scroll down through multiple pages. 5. Userforge: One of the most flexible tools for collaborative user persona template development. By using URLs rather than static documents it allows everyone to easily access the latest iteration of your user personas. The wizard only asks a few simple questions, but you can then add as many sections as you need using your own headings for a comprehensive user persona. 6. UXPRESSIA: Sign up for free to use this persona tool for collaborating with team-mates to create powerful buyer personas. Over 20 tailored sections to incorporate your target audience knowledge. You can stretch, drag and drop sections to customise the layout to meet your specific needs. 7. Xtensio: A free forever buyer persona template creator tool to build as many personas as you like. Also has a “How to guide” to help you with the process. This is one of the better online tools as it asks you to complete an online template to create each persona. It has an extensive range of questions, but each field can be amended to suit your needs. A highly recommended persona creator. Learningspacetoolkit: This is a great free resource website which includes PDF guides on creating personas and running workshops to create user personas. There are some excellent free persona templates here to help you create your buyer personas. To get the most from personas learn how to create a buyer persona to improve conversions. This will help you conduct a customer journey analysis to significantly improve your sales and revenues. Although it’s not an easy process and it will take some time to complete, it will definitely be worth the effort as you should see substantial benefits for your organisation. Neal has had articles published on website optimisation on CXL and Usabilla.com. As an ex-market research and insight manager he also had posts published on the GreenBook Blog research website. If you wish to contact us please send an email to info@conversion-uplift.co.uk. You can follow uson Twitter @conversionupl, see Neal’s LinkedIn profile or connect on Facebook.